Data is a major driver of modern enterprises. It allows to build better products and customer experiences, create sound competitive strategies and gain efficiency in business processes. To be able to capture this value out of the increasing volume and variety of data, companies have adopted a number of data management technologies, both a combination of traditional SQL ones and new ones such as NoSQL, NewSQL, in-memory analytics and many more. The above mentioned trend is resulting in a so-called Polyglot Persistence, that is, storing data on different kinds of databases. Indeed, adoption of new technologies has lead to having more suitable data models for modern needs. It also managed to associate adequate query languages/APIs for dealing with certain data management problems. An example demonstrating the trend are key-value data stores, document-oriented data stores and graph databases. In spite of offering comprehensive solution for major data management issues, Polyglot Persistence did not avoid creating new challenges, mainly related to the updates and queries across data stores. The first pain is related to the consistency of updates. Most NoSQL data stores are non-transactional, which is an actual pain by itself since consistency is not guaranteed for business operations that require to modify multiple rows. The problem is worsened in the polyglot persistence scenario, since now a business operation might require to modify multiple data stores and a failure or concurrent access might result in getting an inconsistent polyglot database due to the lack of transactional consistency guarantees. Another problem lies in the fact that different databases speak different query languages or APIs. When a query across data stores is needed this is simply not supported because the database may speak SQL and another proprietary API, as it happens with MongoDB. CoherentPaaS addresses the aforementioned pains of Polyglot Persistence environments. It leverages a novel technology able to scale out transactional processing. This technology is being integrated with different data stores such as SQL, NoSQL, in-memory analytics and many more. This results in individual data stores with full ACID properties such as a full ACID MongoDB. More interestingly, since all these data stores get integrated with the same scalable transactional engine, CoherentPaaS supports queries across data stores. CoherentPaaS takes radical approach to transactional processing. It enables to combine the native query languages of the underlying data stores with SQL. 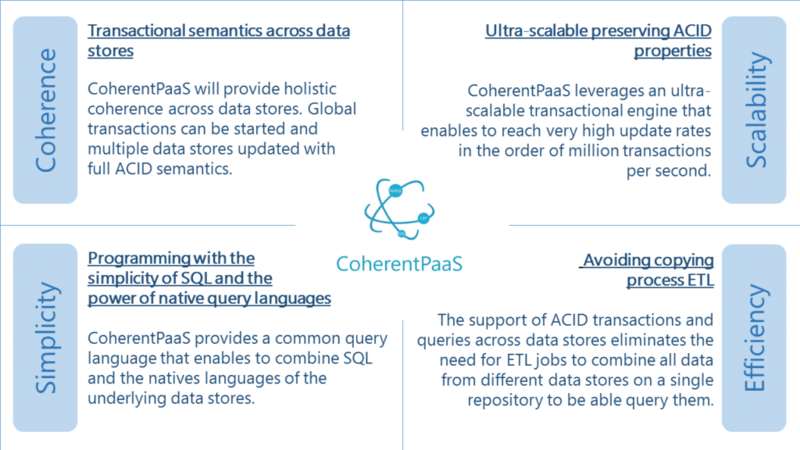 CoherentPaaS combines in an integrated platform SQL (OLTP, in-memory analytics, OLAP), NoSQL (key-value, document-oriented and graph databases) and CEP/data streaming. In this platform applications can start global transactions and update any combination of data stores with full transactional semantics. Applications can also make queries across data stores combining the simplicity of SQL with the power of the underlying native query languages. Ultra-scalable Full SQL Full ACID Operational database. Distributed by LeanXcale. Multi-version ActivePivot. Distributed by Activeviam. Multi-version MonetDB. Open source, distributed by MonetDB. Multi-version MongoDB. Available as open source. Transactional MongoDB. Distributed by LeanXcale. CloudMdsQL compiler. Available as open source. Common query engine. Available as open source. Holistic transactional management. Distributed by LeanXcale. Altaia – Telco QoS Monitoring Systems. Distributed by Altice. CDR Analytics. Distributed by Neurocom. Vehicle Telematics. Distributed by Neurocom. Media Planning & Bibliographic Search. Distributed by Sparsity.